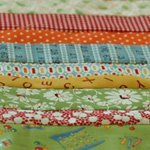 a quilt is nice: scrappy log cabin again. i've put my last two quilts on hold to work on a custom order based on this quilt, only bigger, and in yellow, green and blue. I love the spring yellow. These are such nice blocks with great fabric. you just don't see enough yellow quilts. love this! what a beautiful way to welcome spring. this is gorgeous, can't wait to see the finished product! You continually out-do yourself. I love this yellow. Having been through so many negative things in the past 18 months, I have found myself reaching for yellow over and over again. Maybe because it's so happy? I would be interested in possibly commissioning a quilt from you in these yellows as well. Could you drop me a line? I love the yellows...I'm not usually a "yellow" person...but this quilt just calls to me! I love all that yellow, especially the grey and yellow dot. I think grey and a color is the new brown and a color. Remember when everything was brown and blue for a while? Now it's dark grey and red or yellow. i am SO not a yellow person, but this is SUPER cute!!! Warm, uplifting colors and fabrics--simply beautiful! beautiful! i love yellow, log cabins and scrappy. Absolutely beautiful - I love the yellows! Love the yellow! You are always inspiring by the way. Thank you! for. I love looking at it!!! I really like how bright and cheery this is. I'm so ready for some constant sunshine. Fabulous! sigh. gorgeous. you outdo yourself. my sister's favorite color to quilt with in yellow and mine is red - this gives me inspiration that the two of us should twitch -just once! I was just going to start a red and yellow quilt! I love yellow and I have worked with it yet. This is going to be gorgeous. I love the yellow! LOVE! 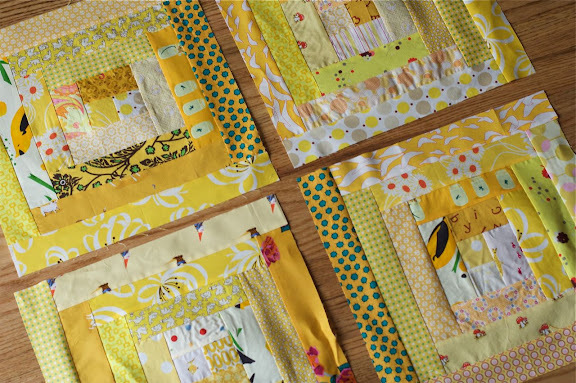 I am really inspired to try a yellow quilt. This is happiness! Love those yellows. Really brightens up the day. It's amazing how just using modern fabrics can update a traditional pattern and completely refresh t.
My first visit to your blog! This log cabin quilt for sure is bringing in the colours of spring. We need it!! Lovely sunny colour scheme, bring on the sun! So pretty! I've been wanting to do a yellow quilt for a while now, but don't have enough of a yellow stash yet... That quilt is going to be beautiful! this is going to be beautiful! i love all the yellow. Yellow makes me happy. I'm loving your log cabin scraps so far! Ooo...lala...summertime and the living is easy...may I have a glass of lemonade with that please? Beautiful, just beautiful!!! Talk about a fabric mixture that puts a smile on a face...good job, Nettie. Are the gnomes going to make a visit in that quilt? Beautiful work. I love the colours. Oh wow! I love this quilt. I just screams sunshine! here comes the sun all warm and friendly. I love your yellow blocks. I love it! so fresh. i think we'll see a lot more yellow in the months to come, it's an optimistic color. I was so excited to find some of these "American Import Quilting Fabrics" in my local store this evening (here in Japan). Wow! Look at you with your 51 comments! I'm not worthy! Just stopping over from our bee inspired! Aaah, spring is on my computer screen! I'll just never log off or look outside MY window!